With Boris Johnson's withdrawal of his candidacy for the leader of the Conservative party the dissembling over the interpretation of the leave vote has finally come to an end – or so it appears, at least. All the candidates with any hope at all of being chosen now accept that sooner or later Article 50 will have to be invoked and thus leave does indeed mean leave. All talk of a further referendum on the Single Market and all the mandarin speculations over EU reform have to be ruled out. a solid rightwing thug who has been rejected for the post in the past. Your guess is as good as mine: only time will tell. The EU Referendum results for Kirklees Council – Jo Cox™ territory – are: 55% Leave, 45% Remain. Critics of the referendum are pointing the finger at David Cameron for this failure. He failed to build momentum among Britain’s allies for fundamental reform of the EU and then he came back from Brussels with a sham of a renegotiation and proceeded, like the PR man he is, to sell it. A common idea, especially in the City of London, is that he should never have promised this referendum as a cynical way to win votes and put off internal party conflicts. And that, having promised it, he should never have delivered it. But the bigger failures belong to John Major, Tony Blair and Gordon Brown for giving in to the Brussels machine. All of them signed away more powers than they had any mandate to give. The Lisbon Treaty was a particularly sordid stitch-up, being a repackaged version of the EU constitution on which Mr Blair had previously promised to hold a vote. Mr Brown famously arrived late to sign the treaty in 2009 so as to avoid the TV cameras. These changes to our system of Government might have passed over voters’ heads in the good times. But the financial crisis, the unprecedented immigration of the last decade and the euro crisis did not. I hope this referendum will be the last we have to suffer through for a long time. Politicians should not regularly outsource major decisions. But when they’ve already outsourced them to remote international bodies, or when they’ve been too arrogant to take account of the popular mood, then it becomes the voters’ turn. A better political class would never have found itself in that position. We are not supposed to speak ill of the dead, especially those who have been brutally murdered.We should wait a week, a month, perhaps a year and then let them have it, possibly driving a stake through the heart just to make sure. Thus, out of decorum, we should wait an appropriate period before examining the life and opinions of Jo Cox™. "Today would have been Jo’s 42nd birthday. 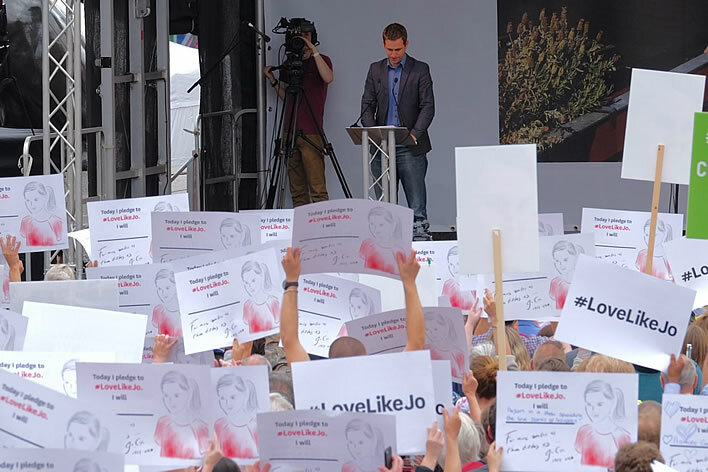 She would have spent it bashing around the streets of her hometown, trying to convince people that Britain is stronger in Europe”, he told the crowd. Mr. Cox added, to prolonged applause, that, “she feared the consequences of Europe dividing again, hated the idea of building walls between us and worried about the dynamics which that would unleash”. It must be distressing for him to see his late wife being transformed into the brand 'Jo Cox™', with all the paraphernalia of hashtags, white roses and shrines. Even the couple's two children have been openly paraded at several of these events. A fund-raising campaign that was opened shortly after his wife's murder has raised well over a million pounds – not for their children but for some interesting political 'charities'. We should not be surprised if this grief-stricken man were even to be subjected to the further appalling strain of becoming the Labour candidate for his late wife's constituency of Batley and Spen, in a coronation unopposed by the other major parties. We should leave him alone and let him grieve in peace. The Mail on Sunday recommends that the British people vote Remain in the looming EU Referendum. Our ancient political system has lasted because it accepts that nobody is ever wholly right, and that nobody is ever right all the time. No Parliament can bind its successors. Every government knows that, in due time, it will lose office to its opponents who can overturn those changes they feel were wrongly forced on them. An excellent summary of everything that the EU isn't: there are no free-thinking successors, no second chances, no chances to overturn anything and – summa summarum – there is a huge democratic deficit. Only the tiniest sliver of this 'proud country' still exists. A Remain majority in the Referendum will eradicate it completely. And no, that abrupt halt is nothing to do with us. At this point it is clear that the writer simply fell off the bar stool, accidentally pressing the submit button on the way down. No doubt when this journalist sobers up and reviews the piece it will be corrected, but until then we will just have to wonder: what could possibly come after 'greater' following a win for Remain? Probably a wise move to keep quiet for a day or two: that's the trouble with polemic. Following the tragic killing of Labour MP Jo Cox, the Conservative Party has decided not to contest the forthcoming by-election as a mark of respect to a much-loved and respected politician. Update: UKIP confirm they won’t field a candidate either. On what basis, apart from virtue signalling? Before 1997 the Batley and Spen constituency elected a Conservative MP. After 1997 (and ignoring all boundary changes) the constituency has elected a Labour MP. Ever since then the Conservatives have attained between 31%-37% of the vote. Under what theory has the Conservative party denied a choice to its loyal 30 plus percent? This is an election, not a coronation. At least in theory constituencies elect a person as their MP. Admittedly, this may be more true in the breach than the observance, since most voters follow their party of choice, sometimes blatantly tribally. Why deny the electors of Batley and Spen the opportunity to dislike the Labour candidate as a person? Labour has been given a free pass to put whoever they want in the seat, electable or not. What good will this gesture do anyway? How can it possibly be termed a 'mark of respect'. Jo Cox is beyond benefitting: why give her successor a free pass and deny the electors of Batley and Spen a choice? Just when one thinks that the reductio ad absurdum has reached its end, new depths of absurdity open up. We learn now that all the main parties are going to abstain from the Batley and Spen byelection, leaving the poor voters of that constituency with no choice at all. We have to assume that the election will go ahead – it is a legal requirement, after all – and that the Labour candidate will make speeches and wander around canvassing without opposition (probably with an expensive armed guard, though). There will be a vote, polling officers and counters will be paid for and the whole expensive byelection machinery will be set in motion for this voting pantomime. Can this possibly be legal? Who knows what the political landscape will look like in a few weeks' time. It would be more fitting to run the byelection properly with the participation of all the parties as a mark of respect for the voters of Batley and Spen. The man who murdered Helen Joanne 'Jo' Cox, the Labour MP for the Batley and Spen constituency in Yorkshire, was by all accounts a lone nutjob. 'Lone' means that he was not part of a conspiracy involving other people. The murder therefore, although tragic, has no wider political interest. There is no need to round up the 'usual suspects'. 'Nutjob' is a technical term meaning that the killer's actions were not rational. We don't need a psychiatrist to examine him and tell us that his actions were not rational: there is no rational basis for assassinating in public in broad daylight an obscure novice MP for an obscure constituency. Since 1997 the constituency of Batley and Spen has had a solid Labour majority, meaning that, if only in party political terms, an assassination of the sitting Labour member makes no sense at all. He is clearly a nutjob. At the time of writing there seems to be no personal motive for killing his victim either, but even if there were, his only possible defence would be insanity. An uncorroborated statement of one of the witnesses to the attack that the killer shouted 'Britain First' has now apparently been retracted by the witness, who claims never to have stated that. No other witness heard the killer shout anything. Too late: the 'Britain First' fantasy has been taken up as truth by those who wish to believe it and has become the basis of an assassination myth. But even if the killer had shouted that, so what? A nutjob is a nutjob and the deranged workings of his mind are of no importance. He could have shouted 'This is for Mother Theresa' or 'Save our badgers'. It makes no difference since it is, after all, just 'a tale / Told by an idiot, full of sound and fury, / Signifying nothing'. If you think that Britain is teeming with nutjob loners who might be tipped over the edge by a careless phrase or a dramatic image and that therefore no phrase or image should be allowed that might excite or move people, well, you have just ruled out all political discourse and turned the whole country into a 'safe space'. It will be interesting to see what psychiatric problems the killer had and read the explanation of why he was free to carry out this savage crime. The original photograph was probably not so bad, before it was 'improved' by digital filtering. The natural skin tones have been removed and the subjects given the waxy pallor of death. There was a craze in advertising photography a few years ago for filters such as this that made humans look a little like bronze statues. The effect was striking and caught the viewer's attention – which is all the advertiser cared about. 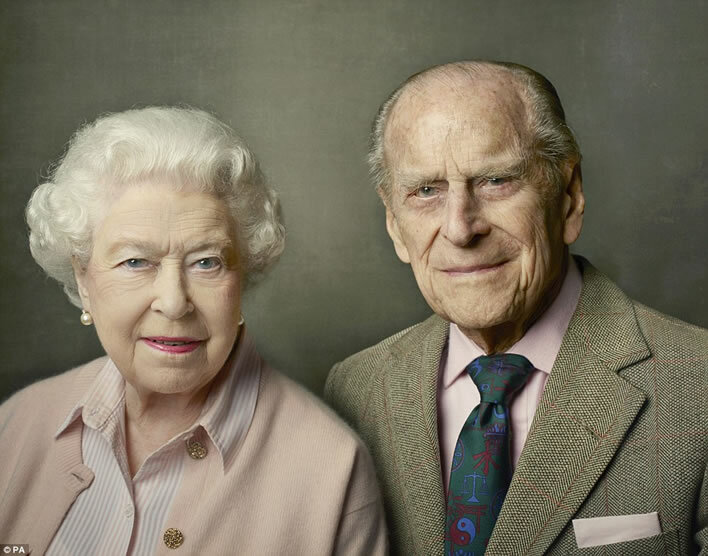 Using similar filtering on a photograph of an elderly couple has done them no favours at all: the effect is initially striking but soon feels simply creepy. Apart from the mutilated skin tones, the background is dark cerecloth (a.k.a. 'Turin shroud') and the main colours are faded rose and washed out beige. Dreadful. 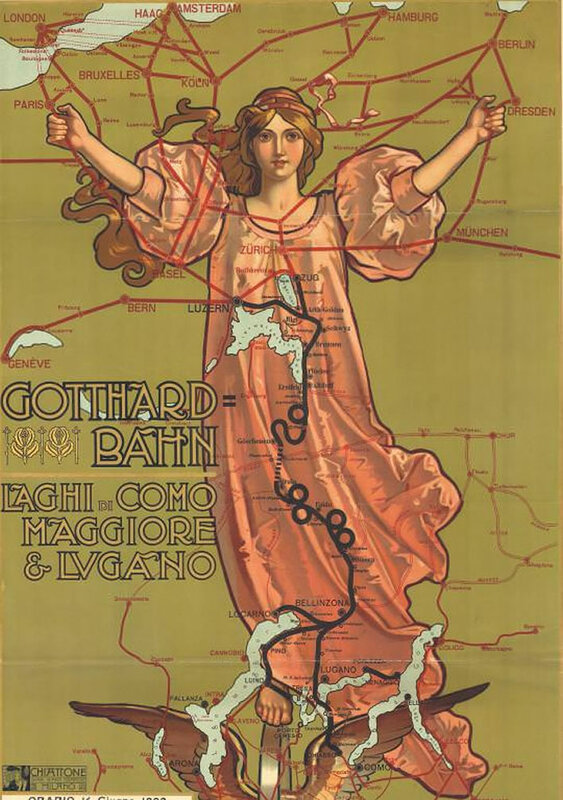 Poster Gotthard-Bahn – Laghi di Como, Maggiore e Lugano, contains the timetable 'Orario 16. Giugno 1902'. Created by G. Chiattone, Milano, 1902. Image: SBB Historic. They just don't do railway timetables like they used to. Update overload in our piece on the National Health Soupkitchen (NHS, a.k.a. Envy-of-the-World™). Avoidable deaths: First day of the Battle of the Somme, three times over, every year. 01.06.2016 – Gotthard tunnel. Gotthard tunnel? After more than 24 years of political and 17 years of engineering work the new Gotthard rail tunnel under the Swiss Alps will be ceremonially opened today. It has cost 12 billion CHF– less than some British IT failures we could mention – and will cut an hour off the rail journey between Zurich and Milan. In every respect the construction of the world's longest and deepest rail tunnel is a brilliant technical accomplishment. This page could be filled with superlatives. Well done, Switzerland! But what is it for? As the project has progressed the need for it has reduced. The EU's interest in a north-south connection between Germany and Italy is now lukewarm: neither of these two states is rushing to complete the promised connecting links. The EU axis of interest is now east-west, not north-south. Who needs Italy? Switzerland's cleaner/greener-than-thou article of faith to push transport from road onto rail is not shared by the surrounding countries, who prefer to keep on truckin' n' cruisin'. In passing we only have to mention that one of the politicians most associated with the new tunnel is someone well known to this blog: Moritz Leuenberger. Enough said. Please can we have our 12 billion CHF back? At the south entrance to the tunnel [the tearful Transport Minister's] colleague, Ueli Maurer, was less emotional. 'We shall see what effect the Base Tunnel and the NEAT will have', said the Finance Minister. So it was not a day of joy for him, a journalist asked. 'Of course', replied the Minister, 'the NEAT is a great feat for Switzerland. But the Base Tunnel was built mainly for the neighbouring countries. They also need to do their bit now'. That's Finance-Minister-speak for 'money down the drain'. Our recent allusion to the deeper, historical significance of the colour brown for Germans recalled an anecdote concerning the renowned bookseller Felix Jud (1899-1985) in Hamburg. Jud's bookshop, though relocated, is still going. Despite his surname, Jud was not a Jew – the Nazis even suggested to him that his life would be easier if he were to change his name, which he didn't. He was solidly anti-Nazi and extremely brave: he sold banned books under the counter to trusted customers and introduced such readers to each other. Nemesis followed such hubris as it must: he was arrested in December 1943, sent to a concentration camp in June 1944, brought before a court in April 1945 and sentenced to four years in prison. The Allies were already in Germany at that moment, so fortunately the four years lasted only four weeks. It is always fascinating to observe how, in the last months of the war, when total defeat was only a matter of weeks or even days away, so many parts of the Nazi system just carried on with business as usual, however hopeless, right up until the final collapse – but that's another story. Let's get back to Jud, who was freed by the British troops in May 1945, almost exactly 70 years ago. In 1933, after the Nazis seized power in Germany, Jud filled his window with copies of a book by the very successful humorous travel writer Richard Katz (1888-1968). This particular book had been published a few years before and described Katz's travels in the Dutch East Indies. Its title? Jolly days with brown people (Heitere Tage mit braunen Menschen).